Performers include: Jerry Nelson, Richard Hunt, Jim Henson, Hans Helmut Dickow, Gerard Parkes, Steve Whitmire, Dave Goelz, Kathryn Mullen, and Karen Prell. Envisioned by Muppets creator Jim Henson, this children’s series was produced with the goal of teaching universal lessons and making it equally understandable by viewers of other countries. The human “wraparound” segments were shot separately for each part of the world where the series would air. 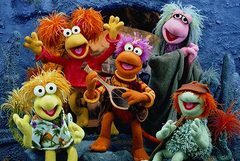 The show focused primarily on the Fraggles, a fun-loving group of creatures that lived in underground tunnels. 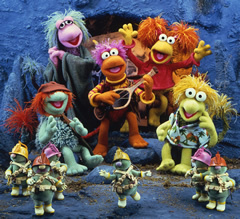 Primary Fraggles are leader Gobo (Jerry Nelson), artistic Mokey (Kathryn Mullen), athletic Red (Karen Prell), nervous Wembley (Steve Whitmire) and worried Boober (Dave Goelz). Other races include the hardworking and tiny Doozers and the giant and furry Gorgs.